Twitter is an effective way to quickly get your posts or information out to followers in 140 characters or less. You can also use twitter to quickly connect with readers and answer questions. Since Twitter forces me to limit correspondence to 140 characters I find I can pop on and tweet without getting bogged down like I do with Facebook. In addition, Twitter levels the playing field. You can respond to any tweet even if that person doesn’t follow you (and you don’t follow them) and that person will see your tweet. Interested? Go to Twitter and click on the sign up button to get your free account. You enter your name, pick a user name (15 letters or under. I recommend your name or your blog name.) Choose a password (make sure it is not related to any other vital password!) and enter your email. Pretty simple. Now you are ready to start tweeting. Before you Start Tweeting, Fill Out your Profile! 1. Upload a picture, nobody wants to follow an egg! 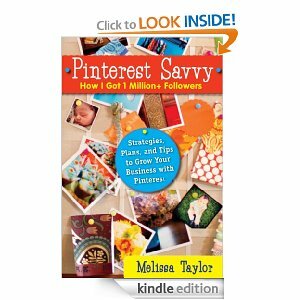 (The one you use on your blog and other social media accounts will work). 3. Write a short bio. You only have 160 characters, so share things that will help people decide if they want to follow you. If you are a frugal blogger, you don’t have to mention your handsome husband and 5 adorable children. If you are a homeschool blogger, the 5 children lend credibility. You know from her bio that she is really parenting a baby, and though she is so many other things, that is the most important piece of information for someone writing posts on the care and feeding of a baby. Make your bio personal, but make it relevant to what you are writing about. Go ahead and pop off a tweet if you must, but then come back to your profile and beneath the box where you entered your web address, you will see a link to add twitter to your blog. Click on that and you can then add a twitter follow button on your blog. If I visit a site and like what I read, I always look for the twitter follow button and am disappointed if I cannot find it. If you are on WordPress, you can use the Social Media Widget Plugin to add links to all of your social media accounts on your sidebar. When I tweet a post, I check to see if there is a Twitter share button at the bottom of the post, if not I use the share button on my tool bar. This will automatically shorten the URL, giving you more room to add comments. You can also use Bitly, if you do not have share buttons on your toolbar, but I find this adds an extra step. To send a tweet to a specific person, put @ in front of the person’s Twitter Username: @BloggingFoodies Do not leave a space between the @ and the Username. If you make a mistake you can delete your tweet and resend it. 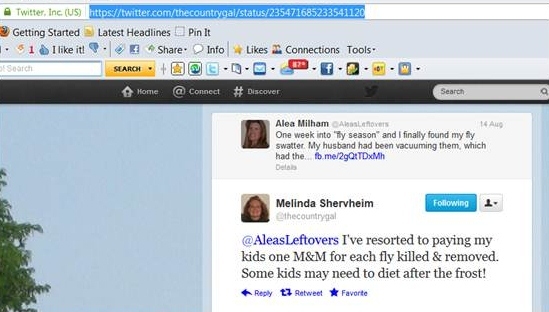 There is a search box in the toolbar at the top of your twitter account. Click on @Connect to view any tweets mentioning you. This means you don’t have to worry about being on twitter all day to catch a tweet directed at you. That is how conversations occur (over several hours/days) despite all of the other tweets, because you can pick up the last comment to you by checking on @Connect. You can also type in your blog name or post title to see if your work is being mentioned. You can retweet a tweet you think your followers will enjoy by clicking the retweet button beneath the post. Or you can copy it, hit reply, paste the original tweet, then add a RT in front of the post. This is useful if you want to retweet it AND add a comment. You can add a hashtag (like #organic, #realfood, #glutenfree, #pizza, #dessert, #chocolate, #gardening, #recipe) to a tweet to reach a specific audience of individuals even if they are not followers. You can add hashtags on any word you like, but it helps if it is a word that people search on. You can also do a search on particular hashtags to see what people are chatting about on that topic to see if it is one you want to use. Adding a #hashtag also increases your chances of being picked up and included in a paper.li, which increases your distribution. Paper.li is an online curation platform which allows people to turn tweets into an online “newspaper”. Don’t use too many hashtags. Pick a couple of hashtags that best represent the content of the link you are tweeting or the community you are trying to reach. If you want to reach several different communities or represent a lot of content with hashtags, it may be better to tweet the link twice and divide the hashtags between the 2 tweets. TweetGrid is a free application that allows you to follow several key words at the same time. There are several tutorials on how to use TweetGrid on their site, but to jump-start, just click on one of the grids 2 x 2 or 2 x 3. In the upper left you will see a log in button, click on it and it will connect to your twitter account ( a twitter button will pop up asking you to authorize access to your twitter account and you click yes. If it is your first time you may have to enter your twitter Username and password. Many applications ask you to log in using your twitter username and password which is why you want to have a very different password for Twitter than your other accounts). I use TweetGrid to easily follow a twitter party. Tweet Grid also allows you to schedule tweets in advance, so if you are a night owl you can schedule tweets for when your readers are actually awake. Start by following people who you know and start by following a fairly small amount of tweeters. I would suggest following 15 – 25 of your favorite bloggers. If you are a regular commenter, they may immediately recognize you from your username and bio and follow you back. Follow people who have tweeted your posts, even if they just mentioned your blog name and not your Twitter Username. They may not have realized that you were on twitter and will probably be delighted to discover that you are. As people follow you, add more followers. As a general rule, I don’t follow people who have thousands of followers, but only follow a few people. I am not interested in being talked at. I also don’t follow people who are only on twitter to sell something. I do follow people who have a product to sell as long as they also share something else besides that product. I follow my local grocery store, although they are obviously selling something, because they share tips, sales and recipes. I followback almost everybody who follows me. When someone follows me and I do not already know them, I view their profile page, read their last several tweets, read their bio, and if I am still not sure, I click through to their website to check them out. What if someone slips through and you find you are following someone you don’t wish to follow. Click on their username, then you will see a button with a gear on it, click on it and scroll down until you see the unfollow option, click and you have officially unfollowed that individual. I have unfollowed people because they used foul language or tweeted about something that I felt was inappropriate. Who Unfollowed Me is an application that allows you to see who unfollowed you. Sometimes people try to manipulate their numbers to gain a high following. They will follow lots of people and once you follow back, they unfollow you. Every so often I check who unfollowed me. Usually the person who unfollowed me was someone who I did not follow to begin with, however if I did follow the person, the Who Unfollowed Me application allows me to quickly unfollow them if I choose to. Do you have feedburner set up for your blog? Feedburner allows non-bloggers to subscribe to your blog without having to set up a blogger account. It also allows people who want all of their blog subscriptions in one place to subscribe in a feed reader via RSS. You can follow the Sit’s Girls Simple Instructions for Setting up Feedburner (and Branding your Feed). If you have Feedburner, you can socialize your feed, so that each new post is automatically sent to twitter. 4. Click on socialize. You will be able to set up twitter feeds from here. Make sure you click the box that says include link, so people can easily find your post. You have the option of having a hashtag automatically attached to each tweet from your blog if you like. If you are a dedicated foodie you may want to add #recipe in the additional text box. You can customize your header and background on your Twitter profile page, but this is not necessary. It is more important to get up and tweeting than to create a pretty background that few people will see. Never add hashtags to your post titles. Adding a hashtag to your post title makes you look lazy and spammy. 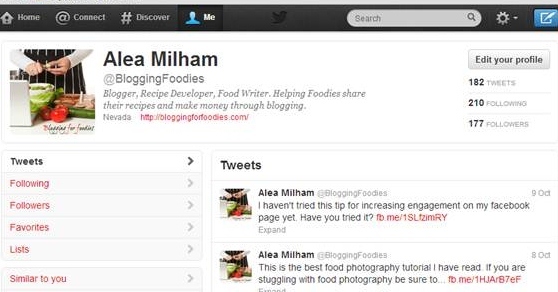 Either add a hashtag specific to your niche through feedburner or create a tweet and add a hashtag. Do not send your Tweets to your Facebook page. Your tweets will seem out-of-place on Facebook and will not generate as much engagement as if you create a unique Facebook status for the same content. If you are on Twitter, leave your Twitter handle in the comments, so I can follow you. There are times when you will want to link to a Facebook status, a tweet or a Pinterest pin in your post. Linking directly to the status has the advantage of bringing your readers up to speed on a conversation, without boring the readers who have already seen it. It also shows those who are not following you on those platforms what they are missing out on. By providing them with a link demonstrating how you use that account, you are giving them more incentive to follow you and participate. 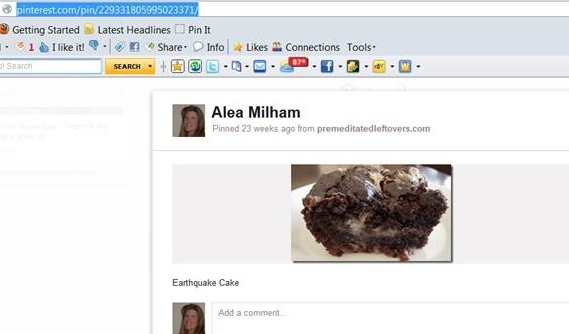 To create a link to a Facebook status, you need to find the URL (permalink) for that status. 1. Each Facebook status has a date and time stamp. You will find it right below your Facebook Page Name. In my case, below Premeditated Leftovers. It might look like 5 minutes ago, 18 hours ago, Tuesday, or 21 July. When you mouse over it, you will see the exact time and date that status was published. Click on the time stamp. 2. Once you click on the link, you will be taken to link for that status. Select and copy the URL. Yesterday, we had a discussion on how to get picky children to eat vegetables on my Facebook page and some of my friends pointed out that it isn’t just children who are picky. Since my husband learned to eat anything while serving in the Navy, it didn’t occur to me that spouses could be also be picky. Although I talk a lot about key words, it really isn’t necessary to use keywords when linking to one of your social media accounts. Creating a link to a tweet on Twitter is similar to creating a link to a Facebook status. 1. On the top right of your tweet, you will find a time stamp. It can look like 15s, 3m, 5h, or 14 Aug. It is directly across from your name and Twitter handle. Click on the time stamp. 2. Once you click on the link, you will be taken to link for that status. (If the tweet is part of a conversation, the tweets before and after it will also show up). Select and copy the URL. 3. Paste that URL into your link box to create a link. My friend Melinda shared her method for keeping her house free of flies. 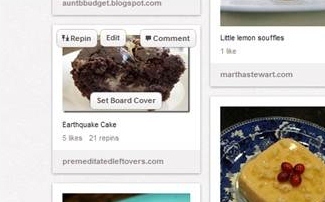 If I wanted to tell my readers that my Earthquake Cake was described as a “chocolate love bomb” on Pinterest, I could use the opportunity to send them to the pin. 1. Ignore all the buttons surrounding the picture and click directly on the picture. 2. Once you click on the picture, you will be taken to link for that status. Select and copy the URL. I know you have links to your social media on your side bar, but some readers will not recognize your link format as such, and still others have become desensitized to all the sidebar links and ignore them. Linking to your social media accounts in your blog posts can increase engagement across your various platforms. It also allows your readers to enter the conversation on a media that they feel comfortable using.